Air system performance is greatly influenced by how the system is designed and how equipment is sized, selected, installed, controlled, and operated within the system. These factors have an influence an order of magnitude greater than the marginal gains possible when attempting to increase the efficiency of any one component. With this in mind, AMCA advocates lifecycle best practices for air systems. 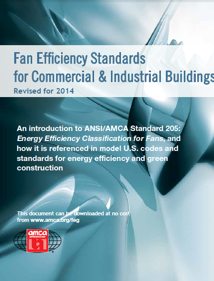 Special Report: Fan Efficiency Guidelines, by Michael Ivanovich, AMCAInternational, Consulting-Specifying Engineer magazine, August 2013. Certified FEG ratings support compliance, enforcement, (sidebar to Special Report article in same issue of CSE), by Michael Ivanovich, AMCAInternational, Consulting-Specifying Engineer magazine, August 2013. The Role of Fan Efficiency in Reducing Energy Use, by Michael Brendel, PhD, Lau Industries; HPAC Engineering magazine, May 2013. Fan Efficiency Regulations - Where Are They Going?, by Michael Ivanovich, AMCAInternational; AMCA inmotion, Summer 2012 (Supplement to the August 2012 issue of ASHRAEJournal). A 2020 Vision for Regulating Air System Efficiency, by Wade Smith, PE, AMCAInternational; AMCA inmotion, Summer 2012 (Supplement to the August 2012 issue of ASHRAEJournal). Fan Motor Efficiency Grades in the European Market, by Armin Hauer, ebm papst, and Joe Brooks, AMCAInternational; AMCA inmotion, Summer 2012 (Supplement to the August 2012 issue of ASHRAEJournal). The Role of Fan Efficiency in Achieving Energy Reduction Goals, by Michael Brendel, PhD, Lau Fan; AMCA inmotion, Summer 2012 (Supplement to the August 2012 issue of ASHRAEJournal). Fan Efficiency Grade:A Cool New Metric to Improve Efficiency, by Martha Hewett, Minnesota Center for Energy and Environment; Blog post July 27, 2012. Fan Efficiency Grades:Answers to Frequently Asked Questions, by Tim Mathson, Greenheck; and Michael Ivanovich, AMCA International. AMCA inmotion. Fall 2011. The Role of Fan Efficiency in Reducing HVAC Energy Consumption, by Michael Brendel, PhD., Lau Industries/Ruskin; AMCA inmotion. Spring 2010. Fan Industry Meeting Energy Challenges, by John Cermak, PhD, PE, ACME Engineering; John Murphy PhD, JOGRAM Inc.; Joe Brooks, PE, AMCA International Inc. AMCA inmotion. Spring 2009. A collection of six articles on fan efficiency that have been previously published in AMCA inmotion. Special Report - Fan Efficiency Guidelines (Republished with persmission from Consulting-Specifying Engineer. Visit the AMCAHigh Performance Air Systems Website! Minimizing Fan Energy, by Scott Smith, PE, Accuspec Inc. HPACEngineering, September 2012. How ASHRAE90.1-2010 Will Affect HVACDesign, by Jeff Boldt, PE, LEEDAP, KJWWEngineering, Consulting-Specifying Engineer, January 2012. Achieving Optimal Fan Performance, by Mark Stevens, AMCAInternational,Consulting-Specifying Engineer. December 2011. High-Performance VAVSystems, by John Murphy, Trane, ASHRAEJournal, October 2011 (search for the title at www.ashrae.org). Select Fans Using Fan Total Pressure To Save Energy, by John Cermak, Ph.D., ACME Engineering, John Murphy, PhD., JOGRAM Inc. ASHRAE Journal. July 2011. Basic Fan Selection, by Tim Mathson, Greenheck. HPAC Engineering. July 2011. How to Select a VFD, by John Yoon, PE, LEED AP, McGuire Engineers Inc. Consulting-Specifying Engineer. November 2010. Fan Selection and Energy Savings, by Brian Mleziva. Greenheck. HPAC Engineering. August 2010. VFDs and Motors: Making the Right Match, Syed M. Peeran, PhD, PE, Camp Dresser & McKee. Consulting-Specifying Engineer. July 2008. High-Performance VAVSystems, by John Murphy. ASHRAEJournal. October 2011. The Case for Increased Ventilation, by David Harlos, ScD, and Michael West, PhD, PE Advantek. HPAC Engineering. March 2010. Pressurization Control in Large Commercial Buildings, by David Moser, PECI. HPAC Engineering. February 2010. Getting More Out of Kitchen Ventilation Systems, Brian Rivet, Greenheck Fan Corp. Consulting-Specifying Engineer. September 2009. Systems design and performance tips for packaged rooftop units (RTUs), by Richard Kronick and Michael Ivanovich. Consulting-Specifying Engineer. March 2009. Mechanical and HVAC Design Goes Underfloor, by David Peters, PE, Southland Industries. Consulting-Specifying Engineer. October 2009. Specifying VAV Boxes, by Jeff Stein, PE, Taylor Engineering. HPAC Engineering, November 2005. A Fresh Look at Fans, by Mark Hydeman, PE and Jeff Stein, PE, Taylor Engineering. HPAC Engineering, May 2003. Note:In 2011, DOE's "Office of Industrial Technologies" was renamed to "Advanced Manufacturing Office"
Software: Fan System Assessment Tool (FSAT). U.S. Department of Energy Industrial Technologies Program. FSAT is a free online software tool that helps industrial users quantify energy use and savings opportunities in industrial fan systems. Technical Paper: DOE Fan System Assessment Tool (FSAT) and Qualified FSAT Specialist Training: A Model for Increasing Industrial Fan System Energy Efficiency, by Anthony Radspieler Jr., and Aimee McKane, Lawrence Berkeley National Laboratory; Philip Jallouk, Oak Ridge National Laboratory; and Joe Brooks, AMCA International. Two-Hour Webcast on Fan System Assessment Tool, from DOE Industrial Technologies Program. Manual: Improving Fan System Performance: A Sourcebook for Industry, by and U.S. Dept. of Energy Industrial Technologies Program, and AMCA International. 1999. Advanced Variable Air Volume System Design Guide, University of California & California State University Project Teams, 2003. Note: This manual is written for HVAC designers and focuses on built-up variable air volume (VAV) systems in multi-story commercial office buildings in California. Estimating annual energy use for a building in the design phase for the purpose of energy labels. The performance of fans in ducted air systems, CIBSE Journal, February 2012. Achieving Optimal Fan Performance, by Mark Stevenson, AMCA International, Consulting-Specifying Engineer, December 2011. PowerPoint PDF:Fan Performance and System Effect, by Mark Stevens, AMCA International, July 2011. As covered in the blog post by Martha Hewett of Minnesota's Center for Energy and Environment, Michael Brendel, PhD, Lau Fan, gave this presentation Fan Efficiency Grades and Selection Points at Peak Total Pressure at the ASHRAEAnnual Meeting in San Antonio. John Cermak, PhD, ACMEEngineering and Manufacturing, presented on the near future fan efficiency codes, standards, and regulations, and their potential impact on fan design and application. Michael Brendel, PhD, Lau Fan, gave a presentation on how fan efficiency grades, as defined by AMCAStandard 205, Energy Classification for Fans, are linked to the fan brake-horsepower requirements in ANSI/ASHRAE/IES Standard 90.1-2010, Energy Standard for Buildings Except Low-Rise Residential Buildings. Click here for Michael Brendel's PowerPoint slides (1-MB PDF). Steve Wiggins, PE, LEEDAP, from Newcomb & Boyd Engineering, then described how commissioning newly installed systems and revisiting the systems after a period of time (or setting up monitoring-based commissioning systems) will reduce wasted energy consumption and costs. Click here for Steve Wiggins PowerPoint slides (1-MB PDF). John Reints, PE, (consulting engineer) and Gene Smithart, PE, Trane, closed the session with an in-depth presentation on high-velocity static-regain duct systems, which reduce first costs and operating costs. Click here for the Smithart/Reints PowerPoint slides (6-MB PDF). Please send comments and suggestions regarding this page to Michael Ivanovich, Director of Industry Relations, AMCAInternational.